OK, I’ve been working on the tutorial for the new presentation of the ALPHAHORN SWING SYSTEM. 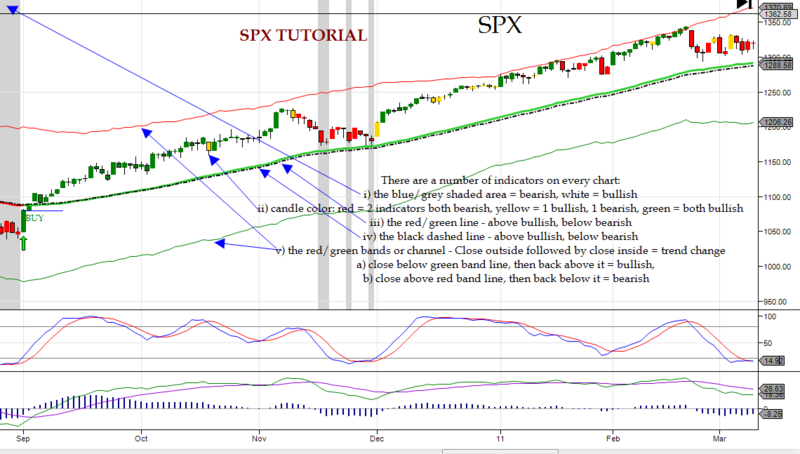 Below are 3 charts. 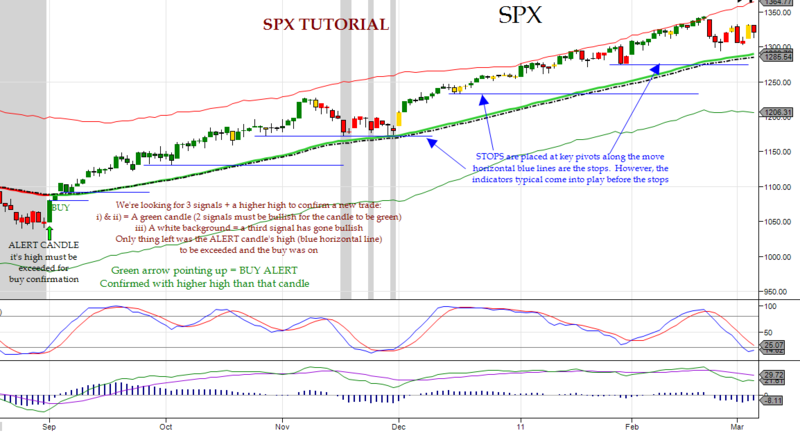 Chart one labels the disparate indicators/signals present on the index charts. 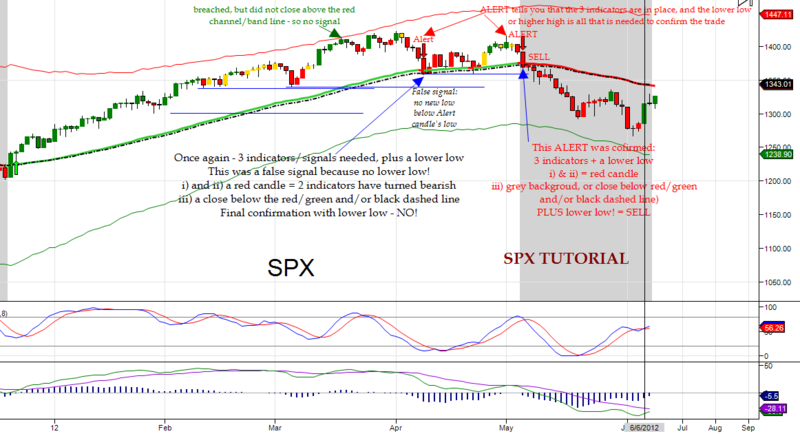 Then charts 2 and 3 illustrate the mechanisms for BUYs, SELLs, ALERTS, CONFIRMATIONS, NON-CONFIRMATIONS (False Signals) and STOPS. Please respond with any questions you may have. When you spend countless hours developing a system it becomes quite intuitive from your perspective and I probably presume things that aren’t readily apparent. So, if anything is fuzzy, vague, confusing…., then please don’t hesitate to ask for clarity. Of course, you can simply just watch the charts each night for the BUY or SELL label. 1. 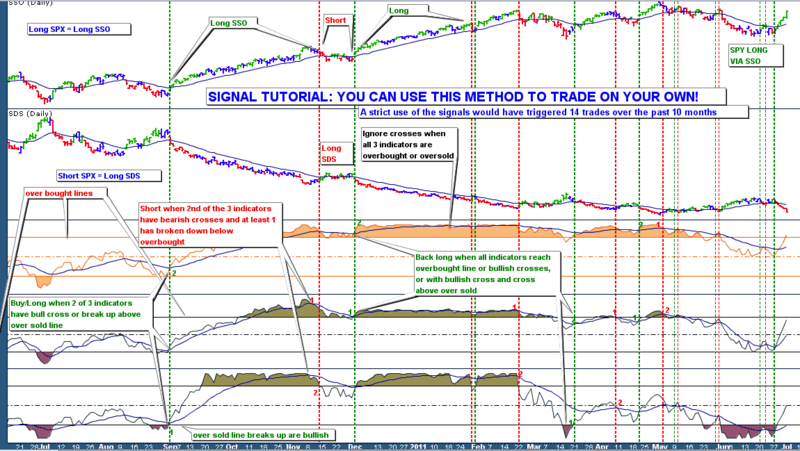 When you first posted these charts and therules back in January, the original rules referred to the 21 EMA cross as yet another trigger, while it is not mentioned in the tutorial. Could you please explain this? 2. Do you use the same short rules to exit longs and enter shorts, or do you have separate rules for exiting? It is clear that one of the rules for exiting is using stops, but this is somewhat grey area for me because one needs to know where to place them, and this seems to be pretty important. Could you please comment on this? i) regarding the 21 EMA it is very relevant for the ENERGY trade and the FINANCIALS, but less so for equities. I’ll post another tutorial for those soon. Also, as I move my stops up or down, the 21 EMA is often my guide. ii) Exits are spelled out on the chart; note there are several different scenarios explained there. Also, as you noted stops do come into play, and to an extent this is where the 21 EMA comes into play.